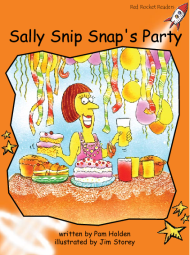 Sally Snip Snap was busy getting ready for her party. What would she have to do to get ready for a party? She asked the children to help her, but nobody would. They all said they were too busy to help. She had to get everything ready all by herself.